This is a multi-functional dig scoop with fruit carving knife. 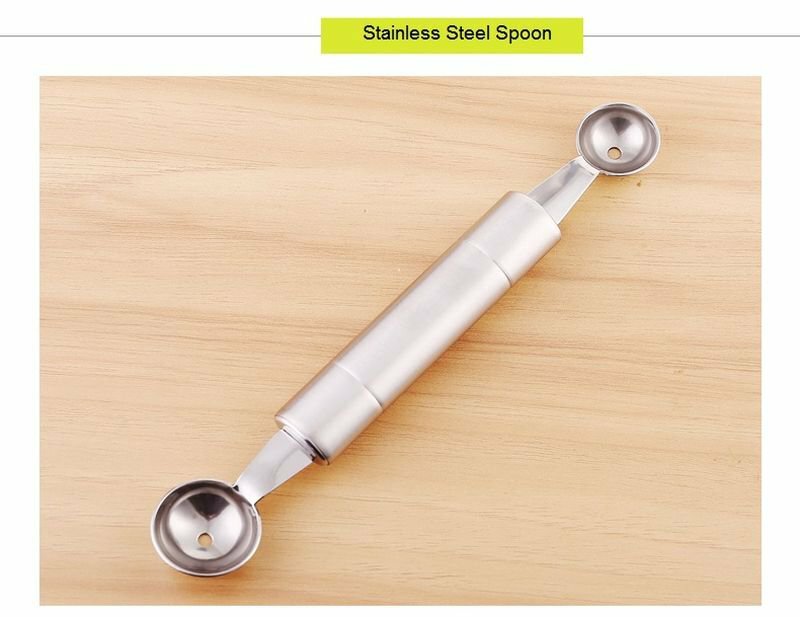 It is suitable for making DIY cold dishes and ice cream balls. Cut all kinds of fancy fruits and vegetables. It is a perfect kitchen tool for housewife. Double sided fruit carving 2 in 1. Suitable for making DIY cold dishes and ice cream balls. 304 Stainless steel, non-toxic, anti rust and anti corrosion, longer durability. Comfortable hand-feel, easy to use. High quality stainless steel material, strong and durable. Thick and durable, easy to clean spoon head & spoon handle, perfect welding. Perfect gift for your friends. This item shipped out from our warehouse in China. Shipping could take between 2 - 6 weeks. 7 - 8 weeks IF stuck in transit. If you do not wish to wait that long, please contact us to get estimate for fast shipping. (Extra fee applies!). Please don't mind, During the manufacturing process, it can have small scratch. Shipping and Handling DOES NOT INCLUDE DUTIES, LOCAL TAXES, Custom fees or ANY OTHER IMPORTATION FEES.